The latest Aladdin production news is here and I am excited to share! The cast is all set and filming has begun! The crew at Longcross Studios and it looks like they are ready to bring us a whole new world. 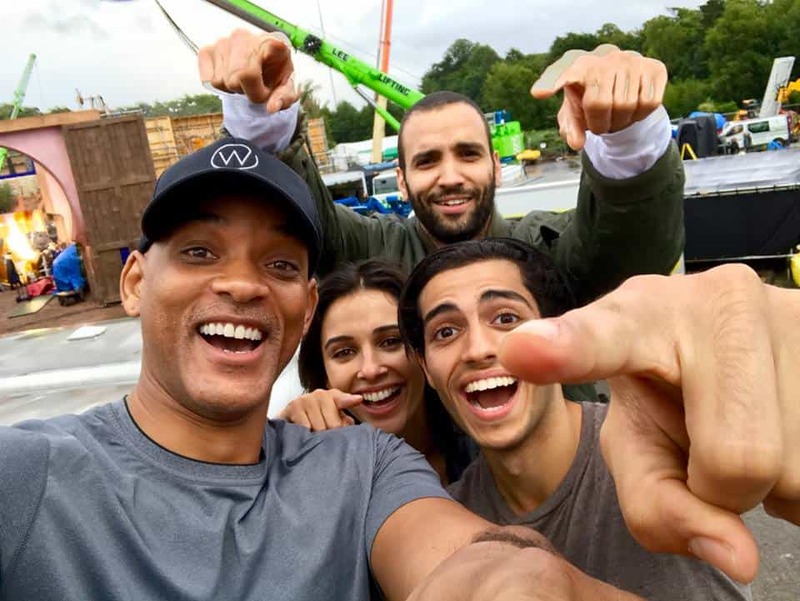 Will Smith, the Genie, shared this selfie of himself, Mena Massed (Aladdin), Naomi Scott (Princess Jasmine), and Marwan Kenzari (Jafar). Also joining the cast are Navid Negahban as the Sultan, Nasim Pedrad as Dalia, Princess Jasmine’s hand maiden and friend, Billy Magnussen as Prince Anders, a suitor from Skanland and potential husband for Jasmine, and Numan Acar as Hakim, Jafar’s right-hand man and head of the palace guards. Are you excited for the live-action Aladdin? I know we are! Previous Post: « Star Wars Fans Find the Force! Aladdin is one of my favorite Disney movies! I am very excited for this! Can’t wait for this one. I still remember going to the movies to see it as a child. Love the cast, and Will Smith as the genie was a brilliant idea! I absolutely love anything Will Smith is in! And I love Aladdin! What a great combo. Oh wow, this is exciting news. I’m loving the cast so far! I can’t wait to see how they play each role. I am happier than a pig in mud about this announcement. So exciting. I love Aladdin and was actually reading about this earlier this week. It looks like it’s going to be a great cast. Can’t wait for it! Um… how did I not know this was coming to theaters as a remake? I AM SO EXCITED!! This is an interesting cast. I can’t wait to check it out. This is such exciting news! I love Aladdin and cannot wait for this! Now this is definitely exciting! My name is Jasmine and my kids always tell me I’m princess Jasmine from Aladdin their favorite movie. Disney does such a good job of translating their animated classics into live action films. Can’t wait to see this one – I love Aladdin, and Will Smith will be great! I absolutely love Aladdin so yes I’m very excited for this! Plus Will Smith is in it so I know it’s going to be good! I would love to take my daughter to see this. I love watching Aladdin. it is the best cartoon series on my kids as well.